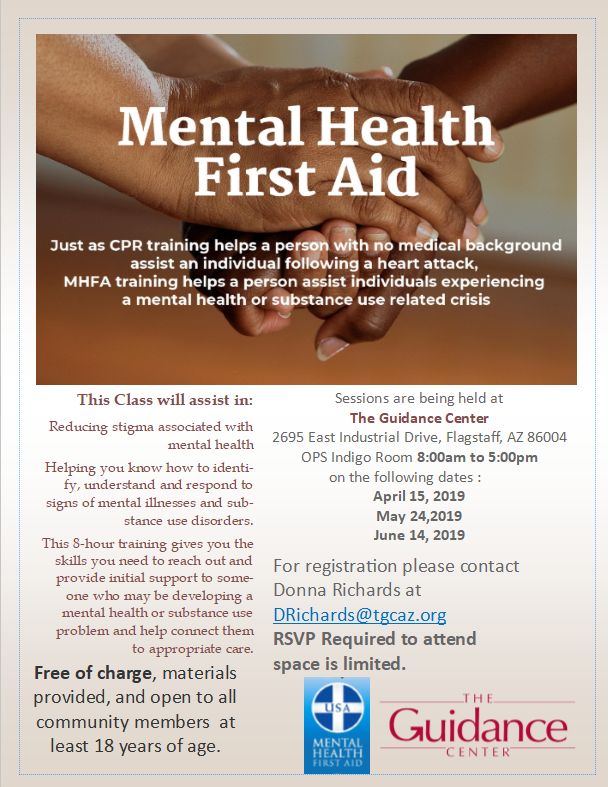 FLAGSTAFF — The Guidance Center will present Mental Health First Aid sessions from 8 a.m. to 5 p.m. April 15; May 24; June 14 at 2695 E. Industrial Drive, Flagstaff. Just as CPR training helps a person with no medical background assist an individual following a heart attack, MHFA training helps a person assist individuals experiencing a mental health or substance use related crisis. The class will assist in reducing stigma associated with mental health, helping you know how to identify, understand and respond to signs of mental illness and substance use disorders. This 8-hour training gives you the skills you need to reach out and provide initial support to someone who may be developing a mental health or substance use problem and help connect them to the appropriate care.